Boise State Broncos running back Alexander Mattison (22) slides into the end zone to score a touchdown against Fresno State Bulldogs defensive back Juju Hughes (23) at Albertsons Stadium. Boise State has had a player leave early for the NFL Draft in five straight years now. Is there a sixth in the cards? In the third week of October, Alexander Mattison passing on his senior year to enter the NFL Draft wasn’t even a thing. Boise State’s junior running back at that time was averaging 71 yards rushing per game and 3.9 yards per carry. Would he even make it to 1,000 this year? Well, in the past six games, Mattison has averaged 162 yards and 5.6 yards per tote and goes into the First Responder Bowl with 1,415 yards, and B.J. Rains of the Idaho Press has draft-evaluating sources telling him Mattison would be a second or third-round pick next spring. 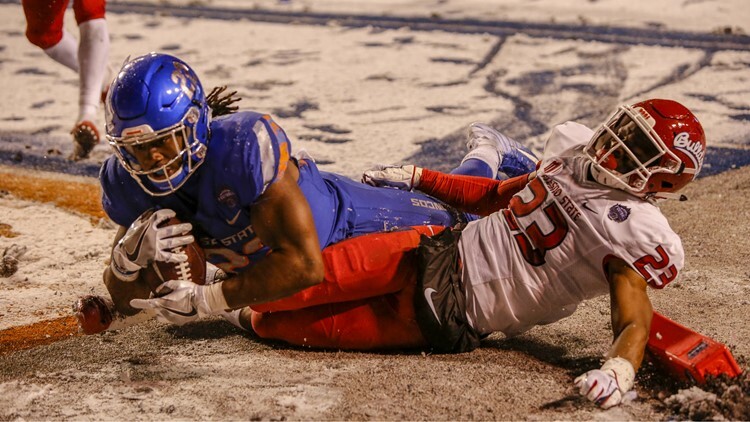 So suddenly it’s “will he stay or will he go?” Mattison looks at his two predecessors and sees Jeremy McNichols and Jay Ajayi as fifth-round picks. It has to be tempting. But how will the journeys of Ajayi and McNichols affect Mattison’s decision? Whispers of a bad knee caused Ajayi to fall to the fifth round in 2015. He had to really grind to prove himself, enduring a trade from Miami to Philadelphia a year ago to become a Super Bowl champion last February. That’s inspiring, although Ajayi is out for the rest of this season with a torn ACL suffered two months ago. McNichols, whose plan always seemed to be to leave early, did not draw elite interest in the draft and lasted until Tampa Bay took him in the fifth round in 2017. The NFL has been a struggle for McNichols. Mattison is an exceedingly smart, humble and hard-working guy, and he may be confident enough now to give it a shot. Let’s look at Boise State’s “succession plan” in the 10 consecutive seasons it has produced 1,000-yard rushers. In most years, there’s been a Bronco understudy behind the feature back. In 2009, Jeremy Avery was backed up by Doug Martin. In 2011, Martin had D.J. Harper behind him. Then Ajayi was Harper’s supporting cast member in 2012, McNichols backed up Ajayi in 2014, and Mattison was behind McNichols two years ago. This season, though, it’s been essentially all Mattison all the time. He has 302 carries, Andrew Van Buren just 34, and Robert Mahone 32. Should Mattison depart, there’ll be one wide open race among unproven candidates to determine a replacement. Time flies. It was on this day five years ago that Chris Petersen officially left Boise State, accepting the job at Washington (see “This Day In Sports” below). Coach Pete capped his first season with the Huskies in the Cactus Bowl while his former team was preparing for its third Fiesta Bowl across the Valley of the Sun. Oklahoma State beat UW 30-22 that night, two years before the Broncos would appear in that game. The following season Petersen and the Huskies played in the Heart of Dallas Bowl, now known as the First Responder Bowl, the Broncos’ destination this year the day after Christmas. Washington rolled Southern Miss in that one 44-31. There are three Big Sky teams left in the FCS Playoffs, and two of them play each other in the quarterfinals Saturday. UC Davis and Dan Hawkins travel to Eastern Washington to try to avenge their lone conference loss of the season. The Aggies out-defensed Northern Iowa 23-16 last week in Davis. The Eagles out-offensed UC Davis 59-20 four weeks ago while rushing for 372 yards. The Aggies and EWU shared the Big Sky title with Weber State, which is also still alive. The Wildcats host Maine Friday night on ESPN2. Former Boise State quarterback Jake Constantine was 18-of-30 for 199 yards and four touchdowns with no interceptions in Weber’s 48-20 victory over Southeast Missouri State last week. Catching up on Mountain West stuff—Bob Davie is set to continue coaching at New Mexico despite finishing 3-9 overall and 1-7 in conference for the second year in a row. Davie is 33-54 in seven seasons with the Lobos. UNM lost two key players last week, as sophomore linebacker Rhashaun Epting and freshman free safety Marcus Hayes both announced they were transferring out of the program. Epting led New Mexico with 5.5 sacks this season, and Hayes led the nation in punt return average at 21.2 yards per runback. It was Hayes who took a punt back 86 yards for a touchdown against Boise State last month. Boise State hoops would like to get Alex Hobbs back in the lineup and get him going, especially from an offensive standpoint. Hobbs has missed four of the last five games during the Broncos’ slide to 2-5 as he tries to bounce back from concusion symptoms and nurses an ankle injury. A lot more was going to be expected this season of Hobbs, the 2018 Mountain West Sixth Man of the Year. The junior guard with the trademark floater hasn’t gotten untracked in the games he has played this season—he’s just 5-for-15 from the field with one three-pointer in limited action. No word on Hobbs’ status for Boise State’s game against Central Washington Saturday afternoon. The first game in Boise State’s home-and-home series with Oregon this month is a week from Saturday. Not that this will be a distraction for the Ducks, but the NCAA committee on infractions placed Oregon's athletic department on two years' probation yesterday for violations in its men's and women's basketball, football and women's track and field programs. The NCAA also ruled that men's hoops coach Dana Altman failed to monitor his director of operations, Josh Jamieson, impermissibly participated in and observed voluntary workouts “at least 64 times.” Sixty-four? It’s been an interesting week in Mountain West basketball. Last night, San Diego State took a gut-punch from cross-town West Coast Conference foe San Diego. The Toreros upset the Aztecs 73-61 with the help of 18 points from former Borah High star Isaiah Wright. It was Wright who gave USD the lead for good midway through the second half, converting a three-point play and then scoring off a nice spin move to make it 52-49. Among the other games, BYU dropped Utah State 95-80, and Arkansas clobbered Colorado State on the Rams’ home floor 98-74. The previous night, New Mexico was embarrassed by rival New Mexico State 100-65. On the other hand, Wyoming rallied for a 73-64 victory over South Carolina last night in Laramie. After a meeting with Washington officials in Boise the night before, Boise State’s Chris Petersen accepts an offer to become the new head football coach at Washington. Petersen took the Broncos to heights unprecedented among non-power conference schools, going 92-12 and winning five league championships and two Fiesta Bowls in eight years at the helm. He’s the only person to win the Paul “Bear” Bryant Coach of the Year award twice. Five days later his former offensive coordinator, Bryan Harsin, was named to replace him.